ASHBURN, Va. - As you enter the data hall, the unusually tall white cabinets dominate your field of view. Standing nine feet tall, these cabinets can house up to 58 servers, compared to the 42 rack units found in a standard seven-foot cabinet. A metal duct emerges from the top of each cabinet, serving as a chimney to the deliver exhaust heat from the servers into a hot air plenum above the ceiling. This is the "proof of concept" room inside ACC7, the massive new data center built by DuPont Fabros Technology in the heart of nothern Virginia's technology corridor. It's where the rubber meets the road for a new design the developer created to improve the energy efficiency of its facilities. The 8,500 square data hall was created to stress-test this design. The room is filled with more than 200 cabinets representing every flavor of air containment, including more than 20 designs from eight different vendors. Each of these cabinets was outfitted with a load bank, an appliance that simulates the electrical and heat loads created by a full rack of servers. DuPont Fabros ran these load banks at power densities of up to 15 kilowatts per cabinets, testing virtually every permutation of loads, rack heights and widths. "It gives us a comfort level to tell our customers that we have designed it, and proven that it works," said Scott Davis, the executive vice president of operations at DuPont Fabros. Why the focus on proving the merits of the new design? ACC7 marks the culmination of a multi-year effort to update DuPont Fabros' data center design to meet the needs of the Internet's most demanding technology companies. DFT houses large chunks of the cloud infrastructure for Facebook, Apple and Microsoft. After close consultation with these tech titan and their other clients, DuPont Fabros' new approach included several significant changes from its previous facilities. The biggest benefit is improved energy efficiency. DFT's initial design, which was notable for its use of an ISO parallel power distribution that allows load sharing across multiple data halls, was developed at a time when uptime was far more important than efficiency. As energy use has gained mindshare among cloud providers, DuPont Fabros has retooled its design to adapt. ACC7 is expected to operate at a Power Usage Effectiveness of about 1.15, a solid improvement over the PUEs of 1.28 seen in earlier facilities on the Ashburn campus. The biggest change was the elimination of raised floor, which is ubiquitous in the enterprise and thus has been a staple of most service provider data centers. But many hyperscale data centers now place racks directly on a slab floor and use containment to manage airflow. Many of the world's most efficient data center use this approach, including company-built facilities for Microsoft and Facebook. ACC7 is DFT's first roll-out of the new design, which also revamps the chilled water cooling and power distribution systems. As it began to market ACC7 to its existing tenants, the proof of concept helped establish a comfort level with the new approach, validating performance in a variety of designs that use hot aisle containment systems. 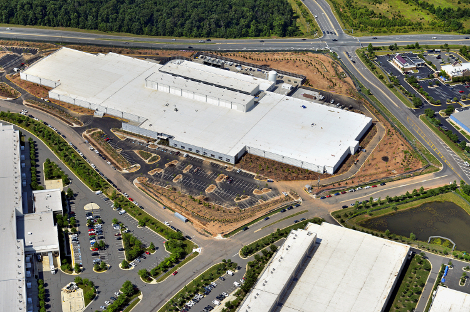 ACC7 is the company's largest data center yet, with a power capacity of 41.6 megawatts and 446,000 square feet of space. The building is more than 1,200 feet in length, or slightly longer than an aircraft carrier. The refinements by DuPont Fabros represent one company's effort to enhance its existing design. This has been the story of the data center industry over the past decade, as a history of secrecy gave way to a community discussion of best practices. One after another, industry innovators have come forward to share their insights and, in some cases, publish the designs so others can improve upon them. This has created a virtuous cycle in which data center builders have boosted their efficiency even as they super-sized their facilities. The powerful growth of the Internet has given these data centers a key role in the transformation of the global economy, disrupting a breadth of industries. Cloud infrastructure has shifted countless offline business processes to highly efficient digital platforms. With great power comes great responsibility. As the data center industry uses more and more power, the relentless focus on greater efficiency and sustainability goes forward as well, at DuPont Fabros and across the industry. One day at a time, one tweak at a time, and always with a vision of doing it even better tomorrow. Author's Note: This is my 7,930th and final post here at Data Center Knowledge, which I founded in 2005. DCK is in good hands, with new leadership and new owners, making this the right moment for me to move on. Please stay in touch by following me on Twitter or connecting with me on LinkedIn.